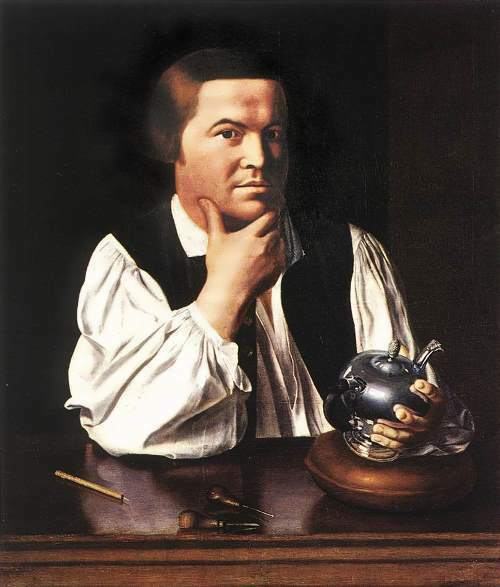 Paul Revere was an American artisan, silversmith in the second generation. 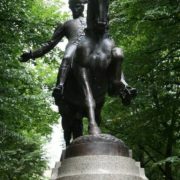 He was one of the most famous heroes of the American Revolution. 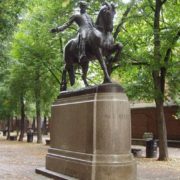 Paul Revere was born in Boston on December 21, 1734 according to the Julian calendar (January 1, 1735, new style). 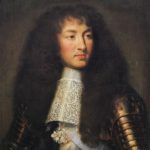 He was a descendant of French Huguenots who fled from the violence and oppression of Louis XIV. 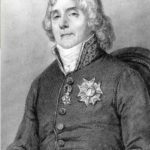 His father Apollos Rivoire (1702-1754) arrived in Boston at the age of 13 and later became the owner of the silversmith shop and married a descendant of the wealthy local family Deborah Hitchborn. Paul was the third of 12 children in the family. In spite of the French origin he did not speak French and became a member of Anglican Church. However, in the end, Paul returned to Calvinist church. Apollos Rivoire died when Paul was 19 years old. 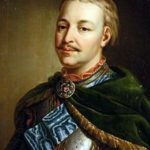 In 1756, with the beginning of the so-called French and Indian War (American episode of the Seven Years’ War), Paul joined the provincial army. Soon, however, he returned to Boston, took over the father’s shop, and then married Sarah Orne. Because of the economic crisis Revere began to work as a dentist. One of his clients was a local physician and opposition leader Joseph Warren. It was he who involved Revere in opposition activities. 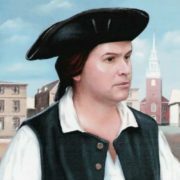 In 1765 he joined the organization Sons of Liberty and soon became its leader. In 1767, Revere made the Sons of Liberty Bowl. Three years later he made a series of topical etchings, including the famous engraving depicting Boston shooting on March 5, 1770. At the end of 1773 Revere, along with Warren, was among the organizers of the Boston Tea Party. 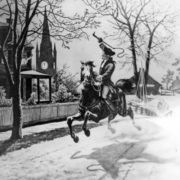 From December 1773 to November 1775 Revere was one of the messengers of the Boston Committee of Public Safety. 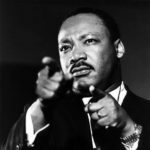 He also organized intelligence agency to spy on the movements of the British troops. 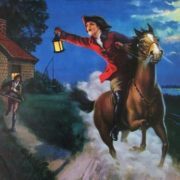 On April 19, 1775, the eve of the battle of Lexington and Concord, Revere rode on horseback to the rebel positions, to warn them of the British troops approaching. Thanks to Revere patriots had time to prepare for a meeting with the royal troops. In Lexington, he also warned John Hancock and Samuel Adams, chief of rebels in Massachusetts. 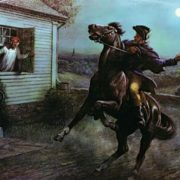 Revere became a national hero. His home in Boston became a museum. 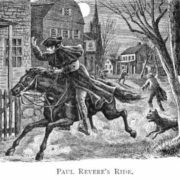 Revere was glorified by American poet Henry Wadsworth Longfellow in his poem Paul Revere Ride. In 1775, Revere worked at the gunpowder factory in Philadelphia. Upon returning to the freed Boston in 1776, Revere joined the Massachusetts militia. He commanded the artillery of the US in June 1779 during an unsuccessful expedition to Penobscot. 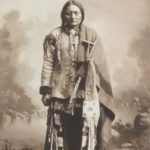 In 1788, he invested in the construction of a plant for the production of silver then opened manufacturing household things of iron and in 792 he became one of the most famous American manufacturers of bells. Copper Plant based by Revere in 1801 works today with branches in Rome, New York and New Bedford (Massachusetts). He died in Boston on May 10, 1818. 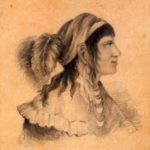 Revere and Sarah Orne had 8 children. However, only daughter, Maria was able to survive his father. Sarah died in 1773. On October 10 of the same year, Revere married Rachel Walker. They also had eight children, three of whom died young.